Subsequent protests against the interim Islamist-led constituent assembly. Government agrees to resign and engages in dialogue discussing the country's new transition. The Tunisian Revolution, also called the Jasmine Revolution, was an intensive campaign of civil resistance. It included a series of street demonstrations which took place in Tunisia, and led to the ousting of longtime president Zine El Abidine Ben Ali in January 2011. It eventually led to a thorough democratization of the country and to free and democratic elections. The demonstrations were caused by high unemployment, food inflation, corruption, a lack of political freedoms like freedom of speech and poor living conditions. The protests constituted the most dramatic wave of social and political unrest in Tunisia in three decades and resulted in scores of deaths and injuries, most of which were the result of action by police and security forces. The protests were sparked by the self-immolation of Mohamed Bouazizi on 17 December 2010 and led to the ousting of President Zine El Abidine Ben Ali 28 days later on 14 January 2011, when he officially resigned after fleeing to Saudi Arabia, ending his 23 years in power. Labor unions were an integral part of the protests. The Tunisian National Dialogue Quartet was awarded the 2015 Nobel Peace Prize for "its decisive contribution to the building of a pluralistic democracy in Tunisia in the wake of the Tunisian Revolution of 2011". The protests inspired similar actions throughout the Arab world, in a chain reaction which became known as the Arab Spring movement. In Tunisia and the wider Arab world, the protests and change in government are called the Revolution or sometimes the Sidi Bouzid Revolt, the name being derived from Sidi Bouzid, the city where the initial protests began. 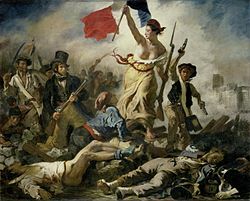 In the Western media, these events have been dubbed the Jasmine Revolution or Jasmine Spring after Tunisia's national flower and in keeping with the geopolitical nomenclature of "color revolutions". The name "Jasmine Revolution" originated from American journalist Andy Carvin, but it was not widely adopted in Tunisia itself. In fact, the debate surrounding the name and the poetic influences behind the Tunisian revolution was a popular question among Tunisian intellectuals themselves as seen in the following article: Tunisia's revolution of dignity and freedom cannot be color-coded. The name adopted in Tunisia was the Dignity Revolution, which is a translation of the Tunisian Arabic name for the revolution ثورة الكرامة (Thawrat al-Karāmah). Within Tunisia, Ben Ali's rise to power in 1987 was also known as the Jasmine Revolution. President Zine El Abidine Ben Ali had ruled Tunisia since 1987, mostly as a one-party state with the Democratic Constitutional Rally (known as the RCD) in power. His government was characterized by the development of Tunisia's private sector in favor of foreign investment, and the repression of political opposition. Foreign media and NGOs criticized his government, which was supported by the United States and France. As a result, the initial reactions to Ben Ali's abuses by the U.S. and France were muted, and most instances of socio-political protest in the country, when they occurred at all, rarely made major news headlines. Riots in Tunisia were rare and noteworthy, especially since the country is generally considered to be wealthy and stable as compared to other countries in the region. Any form of protests in the country were previously successfully repressed and kept silent by the former regime and protesters would be jailed for such actions, as were for example protests by hundreds of unemployed demonstrators in Redeyef in 2008. In fact, as noted by Mohamed Bacha in his book The Revolutionary Chants of Club Africain Ultras, Tunisian youth had managed to circumvent repression and to express their anger and dissatisfaction towards the oppressive regime and social / political injustice for years preceding the Tunisia revolution, notably through the fan chants of Club Africain Ultras who predicted the imminence of a revolution in Tunisia, in chants like: The capital is very angry, We are solidary when we make war to the sons of --- Who oppress us, Hey Regime,The Revolution is Imminent. Al Jazeera English also said that Tunisian activists are among the most outspoken in its part of the world with various messages of support being posted on Twitter for Bouazizi. An op-ed article in the same network said of the action that it was "suicidal protests of despair by Tunisia's youth." It pointed out that the state-controlled National Solidarity Fund and the National Employment Fund had traditionally subsidized many goods and services in the country but had started to shift the "burden of providence from state to society" to be funded by the bidonvilles, or shanty towns, around the richer towns and suburbs. [clarification needed] It also cited the "marginalization of the agrarian and arid central and southern areas [that] continue[s] unabated." The protests were also called an "uprising" because of "a lethal combination of poverty, unemployment and political repression: three characteristics of most Arab societies." It was a revolution, notes a Tunisian geographer, "started not by the middle class or the northern urban centers, but by marginalized social groups." Twenty-six-year-old Mohamed Bouazizi had been the sole income earner in his extended family of eight. He operated a vegetable or apple cart (the contents of the cart are disputed) for seven years in Sidi Bouzid 190 miles (300 km) south of Tunis. On 17 December 2010, a female officer confiscated his cart and produce. Bouazizi, who had had such an event happen to him before, tried to pay the 10-dinar fine (a day's wages, equivalent to 7USD). It was initially reported that in response the policewoman insulted his deceased father and slapped him. The story turned to be false and "had been disseminated and used to mobilize as much as possible against the Ben Ali regime. The officer, Faida Hamdi, stated that she was not even a policewoman, but a city employee who had been tasked that morning with confiscating produce from vendors without licenses. When she tried to do so with Bouazizi a scuffle ensued. Hamdi says she called the police who then beat Bouazizi. A humiliated Bouazizi then went to the provincial headquarters in an attempt to complain to local municipality officials and to have his produce returned. He was refused an audience. Without alerting his family, at 11:30 am and within an hour of the initial confrontation, Bouazizi returned to the headquarters, doused himself with a flammable liquid and set himself on fire. Public outrage quickly grew over the incident, leading to protests. This immolation and the subsequent heavy-handed response by the police to peaceful marchers caused riots the next day in Sidi Bouzid that went largely unnoticed, although social media sites such as Facebook and YouTube featured images of police dispersing youths who attacked shop windows and damaged cars. Bouazizi was subsequently transferred to a hospital near Tunis. In an attempt to quell the unrest President Zine el Abidine Ben Ali visited Bouazizi in hospital on 28 December 2010. Bouazizi died on 4 January 2011.
received the most investment between 1990 and 2011. The leading region. It is a region that had an extensive semi-pastoral farming system, and it became in less than 30 years the premier agricultural region of the country. At the same time Sidi Bouzid had been a ’moderately poor’ region, in a sense, and I put that in quotation marks, and it is now the fourth poorest region in the country. This is the development which people desire... The problem is that the local population does not benefit. These are people from Sfax and the Sahel who get rich in Sidi Bouzid, not the people of Sidi Bouzid. Hence the link with the story of Mohamed Bouazizi. 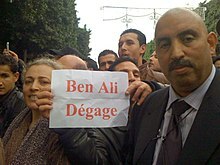 Protesters with a sign that says "Ben Ali, get lost" in French. On 28 November 2010, WikiLeaks and five major newspapers (Spain's El País, France's Le Monde, Germany's Der Spiegel, the United Kingdom's The Guardian, and the United States' The New York Times) simultaneously published the first 220 of 251,287 leaked documents labeled confidential. These included descriptions of corruption and repression by the Tunisian regime. It is widely believed that the information in the WikiLeaks documents contributed to the protests, which began a few weeks later. There were reports of police obstructing demonstrators and using tear gas on hundreds of young protesters in Sidi Bouzid in mid-December 2010. The protesters had gathered outside regional government headquarters to demonstrate against the treatment of Mohamed Bouazizi. Coverage of events was limited by Tunisian media. On 19 December, extra police were present on the streets of the city. On 22 December, Lahseen Naji, a protester, responded to "hunger and joblessness" by electrocuting himself after climbing an electricity pylon. Ramzi Al-Abboudi also killed himself because of financial difficulties arising from a business debt by the country's micro-credit solidarity programme. On 24 December, Mohamed Ammari was fatally shot in the chest by police in Bouziane. Other protesters were also injured, including Chawki Belhoussine El Hadri, who died later on 30 December. Police claimed they shot the demonstrators in "self-defence." A "quasi-curfew" was then imposed on the city by police. Rapper El Général, whose songs had been adopted by protesters, was arrested on 24 December but released several days later after "an enormous public reaction". Violence later increased as Tunisian authorities and residents of Sidi Bouzid Governorate encountered each other once again. The protests had reached the capital Tunis on 27 December with about 1,000 citizens expressing solidarity with residents of Sidi Bouzid and calling for jobs. The rally, which was called by independent trade union activists, was stopped by security forces. The protests also spread to Sousse, Sfax and Meknassy. The following day the Tunisian Federation of Labour Unions held another rally in Gafsa which was also blocked by security forces. At the same time about 300 lawyers held a rally near the government's palace in Tunis. Protests continued again on the 29 December. On 30 December, police peacefully broke up a protest in Monastir while using force to disrupt further demonstrations in Sbikha and Chebba. Momentum appeared to continue with the protests on 31 December and further demonstrations and public gatherings by lawyers in Tunis and other cities following a call by the Tunisian National Lawyers Order. Mokhtar Trifi, president of the Tunisian Human Rights League (LTDH), said that lawyers across Tunisia had been "savagely beaten." There were also unconfirmed reports of another man attempting to commit suicide in El Hamma. On 3 January 2011, protests in Thala over unemployment and a high cost of living turned violent. At a demonstration of 250 people, mostly students, in support of the protesters in Sidi Bouzid, police fired tear gas; one canister landed in a local mosque. In response, the protesters were reported to have set fire to tyres and attacked the office of Constitutional Democratic Rally. Some of the more general protests sought changes in the government's online censorship, where a lot of the media images have been broadcast. Tunisian authorities also allegedly carried out phishing operations to take control of user passwords and check online criticism. Both state and non-state websites had been hacked. On 6 January 95% of Tunisia's 8,000 lawyers went on strike, according to the chairman of the national bar association. He said "The strike carries a clear message that we do not accept unjustified attacks on lawyers. We want to strongly protest against the beating of lawyers in the past few days." It was reported on the following day that teachers had also joined the strike. In response to 11 January protests police used riot gear to disperse protesters ransacking buildings, burning tires, setting fire to a bus and burning two cars in the working class suburb of Ettadhamen-Mnihla in Tunis. The protesters were said to have chanted "We are not afraid, we are not afraid, we are afraid only of God." Military personnel were also deployed in many cities around the country. On 12 January, a reporter from the Italian state-owned television broadcaster RAI stated that he and his cameraman were beaten with batons by police during a riot in Tunis' central district and that the officers then confiscated their camera. A night time curfew was also ordered in Tunis after protests and clashes with police. Hizb ut-Tahrir also organised protests after Friday prayer on 14 January to call for re-establishing the Islamic caliphate. A day later, it also organised other protests that went to the 9 April Prison to free political prisoners. Also on 14 January (the same day that Ben Ali fled), Lucas Dolega, a photojournalist working for European Pressphoto Agency, was hit in the forehead by a tear gas canister allegedly fired by the police at short range; he died two days later. During a national television broadcast on 28 December, President Zine El Abidine Ben Ali criticized people for their protests, calling the perpetrators "extremists and mercenaries" and warned of "firm" punishment. He also accused "certain foreign television channels of broadcasting false allegations without verification, based on dramatization, fermentation and deformation by media hostile to Tunisia." His remarks were ignored and the protests continued. On 29 December, Zine El Abidine Ben Ali shuffled his cabinet to remove his communications minister Oussama Romdhani, while also announcing changes to the trade and handicrafts, religious affairs, communication and youth portfolios. The next day he also announced the dismissal of the governors of Sidi Bouzid, Jendouba and Zaghouan. In January 2011, Ben Ali said 300,000 new jobs would be created, though he did not clarify what that meant. However, he also described the protests as "the work of masked gangs that attacked at night government buildings and even civilians inside their homes in a terrorist act that cannot be overlooked." Ahmed Najib Chebbi, the leader of the Progressive Democratic Party, then said that despite official claims of police firing in self-defense "the demonstrations were non-violent and the youths were claiming their rights to jobs" and that "the funeral processions [for those killed on 9 January] turned into demonstrations, and the police fired [at] the youths who were at these ... processions." He then criticised Ben Ali's comments as the protesters were "claiming their civil rights, and there is no terrorist act...no religious slogans," while accusing Ben Ali of "looking for scapegoats." He further criticized the additional jobs offered as mere "promises." Several webloggers and the rapper Hamada Ben Amor, better known by his stage name El Général, were arrested, but the rapper and some of the bloggers were later released. Reporters Without Borders said the arrest of at least six bloggers and activists, who had either been arrested or had disappeared across Tunisia, was brought to their attention and that there were "probably" others. Tunisian Pirate Party activists Slah Eddine Kchouk, Slim Amamou (later released, and eventually appointed Secretary of State for Sport and Youth by the incoming government) and Azyz Amamy were arrested but later released. Hamma Hammami, the leader of the banned Tunisian Workers' Communist Party and a prominent critic of Ben Ali, was arrested on 12 January, though he was released two days later. On 10 January, the government announced the indefinite closure of all schools and universities in order to quell the unrest. Days before departing office, Ben Ali announced that he would not change the present constitution, which was read as, in effect, promising to step down in 2014 due to his age. On 14 January, Ben Ali dissolved his government and declared a state of emergency. Officials said the reason for the emergency declaration was to protect Tunisians and their property. People were also barred from gathering in groups of more than three, otherwise courting arrest or being shot if they tried to run away. Ben Ali also called for an election within six months to defuse demonstrations aimed at forcing him out. France24 also said the military took control of the airport and closed the country's airspace. On the same day, Ben Ali fled the country for Malta under Libyan protection and landed in Jeddah, Saudi Arabia, after France rejected a request for the plane to land on its territory. Saudi Arabia cited "exceptional circumstances" for their heavily criticised decision to give him asylum saying it was also "in support of the security and stability of their country." The Saudi decision was "not out of sympathy" for Ben Ali (who had long fought against Islamists in Tunisia). Saudi Arabia demanded Ben Ali remain "out of politics" as a condition for accepting him. Following Ben Ali's departure from the country, a state of emergency was declared. Army Commander Rashid Ammar pledged to "protect the revolution." Prime Minister Mohamed Ghannouchi then briefly took over as acting President. On the morning of 15 January, Tunisian state TV announced that Ben Ali had officially resigned his position and Ghannouchi had handed over the Presidency to parliamentary speaker Fouad Mebazaa, with Ghannouchi returning to his previous position as Prime Minister. This was done after the head of Tunisia's Constitutional Court, Fethi Abdennadher, declared that Ghannouchi did not have right to power, and confirmed Fouad Mebazaa as acting President under Article 57 of the Constitution. Mebazaa was given 60 days to organise new elections. Mebazaa said it was in the country's best interest to form a National Unity government. INTERPOL confirmed that its National Central Bureau (NCB) in Tunis had issued a global alert via INTERPOL's international network to seek the location of and arrest former Tunisian President Zine al-Abidine Ben Ali and six of his relatives. A commission to reform the constitution and current law in general was set up under Yadh Ben Achour. There were also calls by the opposition to delay the elections and hold them in six or seven months and with international supervision. Following Ben Ali's departure, violence and looting continued and the national army was reported to be extensively deployed in Tunisia. The identity of the perpetrators has not been determined. A high official of the Tunisian military, however, also stated that elements loyal to former President Ben Ali have deployed across the country. The capital's main train station was also torched. A prison director in Mahdia freed about 1,000 inmates following a prison rebellion that left 5 people dead. Many other prisons also had jail breaks or raids from external groups to force prisoner releases, some suspected to be aided by prison guards. Residents who were running out of necessary food supplies had armed themselves and barricaded their homes, even to the extent of having formed armed neighborhood watches. Al Jazeera's correspondent said there were apparently three different armed groups: the police (250,000 people of the country's population were supposedly part of the police force), security forces from the Interior Ministry, and irregular militias supportive of Ben Ali who were vying for control. Gun battles took place near the Presidential Palace between the Tunisian army and elements of security organs loyal to the former regime after Ali Seriati, head of presidential security, was arrested and accused of threatening state security by fomenting violence. The Tunisian army was reportedly struggling to assert control. Gunfire continued in Tunis and Carthage as security services struggled to maintain law and order. The most immediate result of the protests was seen in increased internet freedoms. While commentators were divided about the extent to which the internet contributed to the ousting of Ben Ali from power, Facebook remained accessible to roughly 20% of the population throughout the crisis whilst its passwords were hacked by a country-wide man-in-the-middle attack, YouTube and DailyMotion became available after Ben Ali's ouster, and the Tor anonymity network reported a surge of traffic from Tunisia. 17 January - Ghannouchi announces his cabinet, including twelve members of the ruling RCD, the leaders of three opposition parties (Mustapha Ben Jafar from the Democratic Forum for Labour and Liberties (FTDL), Ahmed Brahim of the Ettajdid Movement, and Ahmed Najib Chebbi of the Progressive Democratic Party), three representatives from the Tunisian General Labour Union (UGTT) and representatives of civil society (including prominent blogger Slim Amamou). Three notable movements not included in the national unity government were the banned Ennahda Movement, the communist Tunisian Workers' Communist Party and the secular reformist Congress for the Republic. Daily protests begin against the presence of RCD members in the new government. Thousands of anti-RCD protesters rally in a protest with relatively little violence between security services and protesters. 18 January - Street protests against RCD participation in the new government include hundreds of people demonstrating in Tunis, Sfax, Gabes, Bizerta, Sousse and Monastir. The three members of the UGTT and Ben Jafaar of the FTDL quit it, saying that they had "no confidence" in a government that still featured members of the RCD party that ruled under Ben Ali. Mustapha Ben Jafar also refuses to take up his post. The interim President, Mebazaa, and Prime Minister Ghannouchi resign their memberships of the RCD in a bid to calm protests against the inclusion of RCD members in the government. Ghannouchi states that all members of the national unity government had "clean hands." 19 January - Protests continue - with the demand that no "former allies" of Ben Ali should remain in the government, including hundreds of protesters marching in central Tunis and about 30 staging a sit-in near the Ministry of the Interior, ignoring a curfew. Protesters also called for the RCD to be disbanded. 20 January - Hundreds of people demonstrate outside the RCD headquarters in Tunis with the same aims, and protests in other towns around Tunisia are reported. Zouhair M'Dhaffer, a close confidant of Ben Ali seen as the main architect of the 2002 constitutional reform to lift term limits, resigns from the government. All other RCD ministers resign from the party on the same day and the central committee of the RCD disbands itself on that day. The new government announces in its first sitting that all banned parties would be legalised and that all political prisoners would be freed. It was unclear whether the ban on these parties and the ban on Hizb ut-Tahrir would be lifted until 12 March 2011, when they were declared as banned again. The Ennahda Movement on the other hand, got a permit. 21 January - Thousands participate in protests outside the Interior Ministry. Ghannouchi commits to resigning after holding transparent and free elections within six months. 23 January - Thousands of police begin to join protests in Tunis over salaries and to deflect blame over political deaths attributed to them during Ben Ali's rule. 24 January - As army chief Rachid Ammar announces that the armed forces are on the side of the protesters and would "defend the revolution", rumours emerge that the government would be replaced by a council of "wise men". 25 January - Protesters continue to defy a curfew in Tunis as reverberations continued around the region. 26 January - International arrest warrants issued for Ben Ali, his wife and several other members of his family. 27 January - Prime Minister Mohammed Ghannouchi reshuffles his government and announces a new cabinet. Six former members of the RCD party leave the interim government, including Defense Minister, Foreign Minister, Finance Minister and Interior Minister. Apart from the prime minister, the new government retained just two ministers from Ben Ali's old government—the industry and international cooperation ministers—but neither of these had been a member of his ruling RCD party. This move was seen as meeting one of the demands of the protesters in Tunisia, and was supported by the UGTT, which stated its support for the reorganized cabinet. New ministers included independent state attorney Farhat Rajhi as interior minister, retired career diplomat Ahmed Ounaies as foreign minister and Elyes Jouini (an economist living in France) as minister delegate to the prime minister in charge of administrative and economic reform. 28 January - Hundreds of people camp beside Mohamed Ghannouchi's office protesting against his remaining in the interim government. A student coordinating food distribution at the protests, Saifeddine Missraoui, stated, "We are not leaving here until Ghannouchi leaves and we get a brand new government." Another protester, Naim Garbousi from Casbah Media Relations, stated, "The new line-up is a theatre. The symbols of the old regime are left, like Ghannouchi. Why is he insisting on staying? We are 10 million people, there will surely be someone who can replace him." 2 February - Former interior minister, Rafik Belhaj Kacem arrested by his successor, Farhat Rajhi, concurrently with accusations of former allies of Ben Ali trying to destabilize the state. 3 February - All 24 regional governors are replaced. The Interior Ministry replaces 34 top-level security officials in a bid to bring change to the police, security services and spies that were a part of Ben Ali's security infrastructure. The interim head of state Fouad Mebazaa promises a national dialogue to address protester demands. 4 February - Sidi Bouzid again the scene of protests despite the arrests of two security forces personnel for deaths of two. Several hundred people turned up at the local police station as a result of medical staff at a local hospital saying they found signs of burning on the victims' bodies. On 5 February, protesters in El Kef called for the local police chief Khaled Ghazouani to be sacked for abusing his authority. Protesters threw stones and small firebombs as well as burned two cars, one of which was a police vehicle. Police first responded with tear gas and then fired on the protesters in which two people were killed immediately and two died in hospital, 15 others were also wounded. The region's prefect Mohamed Najib Tlijali called for calm as the police chief was arrested. * 13 February - Foreign minister Ahmed Ounaies resigns over controversial praise he gave to French Foreign Minister Michele Alliot-Marie, who was being criticised for her ties to Ben Ali. Mouldi Kefi becomes the new foreign minister on 21 February. 6 February - The former ruling RCD's activities are suspended to prevent a breakdown in state security, with an order for dissolution of the party pending. 7 February - Tunisia's Defense Ministry calls up recently retired soldiers as the country is still struggling to contain unrest. Soldiers retired within the last five years, as well as those who had recently completed their mandatory military service, were asked to report for duty. First steps taken on a bill that would give the interim President, Fouad Mebazaa, emergency powers, allowing him to bypass the RCD-dominated parliament. 8 February - An agreement is reached between the interim government and the UGTT on nomination of new governors. 9 February - The bill to grant Fouad Mebazaa emergency powers is passed on 9 February. He states that all banned parties will be legalized within days. The bill also allows Mebazaa to ratify international human rights treaties without parliament; He has previously stated Tunisia would accede to the International Convention for the Protection of All Persons from Enforced Disappearance, the Rome Statute of the International Criminal Court, the Optional Protocol to the Convention against Torture and other Cruel, Inhuman or Degrading Treatment or Punishment, and the First and Second Optional Protocol to the International Covenant on Civil and Political Rights (which would mean abolishing the death penalty). 19 February - Protests flare up again, with 40,000 protesters demanding a new interim government completely free of any people associated with the old regime. Protesters also demand a parliamentary system of government instead of the current presidential one. As a date was announced for an election in mid-July 2011, more than 100,000 protesters continued to demand the removal of Ghannouchi as interim prime minister. 28 February - Two more ministers resign (industry minister Afif Chelbi and international co-operation minister Mohamed Nouri Jouini) amid continuing protests for the entire interim government to resign, with the UGTT calling for an elected constituent assembly to write a new constitution. 1 March - The Ennahda Movement is legalized. The resignations of the Minister for Higher Education and Scientific Research Ahmed Brahim and the Minister of Local Development Ahmed Nejib Chebbi are officially announced by the Tunis Afrique Presse (TAP) agency. A private radio broadcaster Shems FM also reported that the Minister of Economic Reform Elyes Jouini had resigned as well. 3 March - President Mebazaa announces that elections to a Constituent Assembly would be held on 24 July 2011; this likely means that general elections will be postponed to a later date. This fulfilled a central demand of protesters. 7 March - The interim government announces that the secret police will be dissolved, one of the hallmarks of Ben Ali's rule. 9 March - A court in Tunis announces the dissolution of the former ruling party, the Rally for Constitutional Democracy (RCD), and the liquidation of its assets and funds, but the party said it would appeal the decision. 14 April - It is announced that Ben Ali will face 18 charges, including voluntary manslaughter and drug-trafficking. His family and former ministers are also going to face 26 further charges. 23 October - Tunisians vote for the first time post-revolution. The election appointed members to a Constituent Assembly charged with rewriting Tunisia's Constitution. The formerly banned Islamic party Ennahda won by capturing 41% of the total vote. Prime Minister Mohamed Ghannouchi's government asked Saudi Arabia to extradite Ben Ali saying that "following a new batch of charges against the ousted president regarding his involvement in several serious crimes aimed at perpetrating and inciting voluntary homicide and sowing discord between the citizens of the same country by pushing them to kill one another." Reports emerged on 18 February 2011 that Ben Ali had had a stroke and was gravely ill. Plans for a general amnesty were also announced on that day. In mid-February 2011, about 4,000 mostly Tunisian refugees landed on the Italian island of Lampedusa, causing the authorities to declare a state of emergency that would allow for federal aid to the island. Interior Minister Roberto Maroni accused the EU of not doing enough to curb immigration and asked them to do more. He said that the "Tunisian system was 'collapsing'" and that he would "ask the Tunisian Foreign Ministry for permission for our authorities to intervene to stop the flow in Tunisia," suggesting Italian troops would be on Tunisian soil. He called the event a "biblical exodus." The comments started a row between the two countries with the Tunisian Foreign Ministry saying it was ready to work with Italy and others but that it "categorically rejects any interference in its internal affairs or any infringement of its sovereignty." In response, Italy's Foreign Minister Franco Frattini said that both countries share a "common interest" to halt the immigration, while he also offered "logistical help in terms of police and equipment. Until now the system of patrolling the coasts of Northern Africa has worked and we want to re-establish the technique, which had reduced illegal immigration to zero until a month ago." Tunisia then said that it had troops patrolling southern fishing ports and that checkpoints had been erected in coastal towns. By 14 February, at least 2,000 refugees had been sent to Sicily with the other 2,000 quarantined at a re-opened holding center. On 2 March about 350 more people arrived on the island. In response Italy declared a humanitarian emergency. The International Organisation for Migration said that no new boats had been spotted. The EU's Catherine Ashton was on a visit to Tunisia to discuss the issue. German Chancellor Angela Merkel said that "not everyone who does not want to be in Tunisia can come to Europe. Rather, we need to talk to each other how we can strengthen the rule of law in Tunisia again and whether Europe can be of help." The national stock market, the TUNINDEX, fell on 12 January for a three consecutive day loss of 9.3%. Following the curfew in Tunis, the market index again fell 3.8% as the cost of protecting against a sovereign default in credit default swaps rose to its highest level in almost two years. Following Ghanoucchi and two other Ben Ali-era ministers resigning, the bourse was again suspended. Demonstration in support of the Tunisian protests in Nantes, France, 15 January 2011. Many governments and supranational organisations expressed concerns over use of force against protesters. France, the former colonial power of Tunisia, was one of just a few states that expressed strong support for the Ben Ali government prior to its ouster, though protests were held in solidarity with Tunisia in several French cities and the French Socialist Party voiced support for the popular revolution. "The rest will follow". Symbolic middle finger gesture representing the Tunisian Revolution and its influences in the Arab world. From left to right, the fingers are painted as flags of Libya, Egypt, Tunisia, Sudan and Algeria. The red-painted hand may be interpreted as a symbol of revolution. The protests and resultant political crisis have generally been called the Jasmine revolution' only in the foreign media. Tunisian philosopher Youssef Seddik deemed the term inappropriate because the violence that accompanied the event was "perhaps as deep as Bastille Day," and although the term was coined by the Tunisian journalist Zied El Hani, who first used it on his blog on 13 January and initially spread via social media such as Facebook (hence "Revolution Facebook" among the youth of Tunisia), it is not in widespread use in Tunisia itself. The lack of coverage in the domestic state-controlled media was criticized. Writer/activist Jillian York alleged that the mainstream media, particularly in the Western world, was providing less coverage and less sympathetic coverage to the Tunisia protests relative to Iranian protests and the Green movement and China's censorship. York alleged the "US government—which intervened heavily in Iran, approving circumvention technology for export and famously asking Twitter to halt updates during a critical time period—has not made any public overtures toward Tunisia at this time." Despite criticism about the "sparse" level of coverage and "little interest" given to the demonstrations by the international media, the protests were hailed by some commentators as "momentous events" in Tunisian history. Brian Whitaker, writing in The Guardian, suggested on 28 December 2010, that the protests would be enough to bring an end to Ben Ali's presidency and noted similarities with the protests that led to the end of Nicolae Ceauşescu's reign in Romania in 1989, although Steven Cook, writing for the Council of Foreign Relations, notes that a tipping point is only obvious after the fact, and points to the counter-example of the 2009-2010 Iranian election protests. Ben Ali's governing strategy was nevertheless regarded as in serious trouble, and Elliot Abrams noted both that demonstrators were able for the first time at the end of 2010 to defy the security forces and that the regime had no obvious successors outside of Ben Ali's own family. The French management of the crisis came under severe criticism with notable silence in the mainstream media in the run-up to the crisis with its former protectorate with which it maintained friendly relations. Al Jazeera believed the ousting of the president meant the "glass ceiling of fear has been for ever shattered in Tunisia and that the police state that Ben Ali created in 1987 when he came to power in a coup seems to be disintegrating", though it added that Ben Ali's resignation, following his statement that he had been "duped by his entourage" may not entirely be sincere. Le Monde criticized French President Nicolas Sarkozy and the European Union's "Silence over the Tragedy" when the unrest broke. The Christian Science Monitor suggested that mobile telecommunications played an influential role in the "revolution." The revolt in Tunisia began speculation that the Tunisian Jasmine Revolution would lead to protests against the multiple other autocratic regimes across the Arab world. This was most famously captured in the phrase asking whether "Tunisia is the Arab Gdańsk?". The allusion refers to the Polish Solidarity movement and Gdańsk's role as the birthplace of the movement that ousted Communism in Eastern Europe. The phrase appeared in outlets such as the BBC, as well as editorials by well known columnists Rami Khouri and Roger Cohen. Larbi Sadiki suggested that although "conventional wisdom has it that 'terror' in the Arab world is monopolized by al-Qaeda in its various incarnations", there was also the fact that "regimes in countries like Tunisia and Algeria have been arming and training security apparatuses to fight Osama bin Laden [but] were [still] caught unawares by the 'bin Laden within': the terror of marginalisation for the millions of educated youth who make up a large portion of the region's population. The winds of uncertainty blowing in the Arab west – the Maghreb – threaten to blow eastwards towards the Levant as the marginalized issue the fatalistic scream of despair to be given freedom and bread or death." A similar opinion by Lamis Ardoni carried by Al Jazeera said that the protests had "brought down the walls of fear, erected by repression and marginalization, thus restoring the Arab peoples' faith in their ability to demand social justice and end tyranny." He also said that the protests that succeeded in toppling the leadership should serve as a "warning to all leaders, whether supported by international or regional powers, that they are no longer immune to popular outcries of fury" even though Tunisia's ostensible change "could still be contained or confiscated by the country's ruling elite, which is desperately clinging to power." He called the protests the "Tunisian intifada" which had "placed the Arab world at a crossroads." He further added that if the change was ultimately successful in Tunisia it could "push the door wide open to freedom in Arab word [sic]. If it suffers a setback we shall witness unprecedented repression by rulers struggling to maintain their absolute grip on power. Either way, a system that combined a starkly unequal distribution of wealth with the denial of freedoms has collapsed." Similarly, Mark LeVine noted that the events in Tunisia could spiral into the rest of the Arab world as the movement was "inspiring people...to take to the streets and warn their own sclerotic and autocratic leaders that they could soon face a similar fate." He then cited solidarity protests in Egypt where protesters chanted "Kefaya" and "We are next, we are next, Ben Ali tell Mubarak he is next;" and that Arab bloggers were supporting the movement in Tunisia as "the African revolution commencing...the global anti-capitalist revolution." He pointed to an article in al-Nahar that talked of an "inhuman globalization" that had been imposed on the Arab world, however a "human" nationalism had not taken place. LeVine then accused the Obama administration in the United States of double standards when Clinton was in the region meeting with political and civil society leaders; however, she responded to a question about the protests, saying "We can't take sides", which was read[by whom?] as a failure to seize the "reins of history" and "usher in a new era" to "defeat the forces of extremism" without the violent conflict in the Afghanistan-Pakistan area. Pointing out Clinton's remarks about regimes whose "foundations are sinking into the sand" and needed "reform", LeVine argued that US foreign policy in the Middle East and the Muslim world was "equally in danger of sinking into the sands if the President and his senior officials are not willing to get ahead of history's suddenly accelerating curve." He added, "It is the US and Europe, as much as the leaders of the region, who in Clinton's words are in need of 'a real vision for that future.'" Finally he said there were two scenarios that could play out: "a greater democratic opening across the Arab world," or a similar situation to Algeria in the early 1990s when the democratic election was annulled and Algeria went into a civil war. Robert Fisk asked if this was "The end of the age of dictators in the Arab world?" and partly answered the question in saying that Arab leaders would be "shaking in their boots". He also pointed out that the "despot" Ben Ali sought refuge in the same place as the ousted Idi Amin of Uganda and that "the French and the Germans and the Brits, dare we mention this, always praised the dictator for being a 'friend' of civilized Europe, keeping a firm hand on all those Islamists." He notably pointed at the "demographic explosion of youth" of the Maghreb, though he said that the change brought about in Tunisia may not last. He thinks "this is going to be the same old story. Yes, we would like a democracy in Tunisia – but not too much democracy. Remember how we wanted Algeria to have a democracy back in the early Nineties? Then when it looked like the Islamists might win the second round of voting, we supported its military-backed government in suspending elections and crushing the Islamists and initiating a civil war in which 150,000 died. No, in the Arab world, we want law and order and stability." He added that "If it can happen in the holiday destination Tunisia, it can happen anywhere, can't it?" Blake Hounshell wrote on Foreign Policy.com that the Tunisian precedent raised the prospect of a "new trend. There is something horrifying and, in a way, moving about these suicide attempts. It's a shocking, desperate tactic that instantly attracts attention, revulsion, but also sympathy." The use of communication technologies, and the Internet in particular, has been widely credited as contributor to the mobilisation of protests. A blog associated with Wired described the intricate efforts of the Tunisian authorities to control such online media as Twitter and Facebook. Other regional regimes were also on higher alert to contain spillover effects that may ensue. On 11 March 2011, Reporters Without Borders gave its annual award for online media freedom to the Tunisian blogging group Nawaat.org. Founded in 2004, it played an important role rallying anti-government protesters by reporting on the protests which the national media ignored. Bouazizi's actions resonated across the region, with many others across the Arab world following suit. In January 2011, the BBC reported: "Clearly the self-immolation of Mohamed Bouazizi has resonated across the region...'There is great interest. The Egyptian people and the Egyptian public have been following the events in Tunisia with so much joy, since they can draw parallels between the Tunisian situation and their own.'" After the beginning of the uprising in Tunisia, similar protests took place in almost all Arab countries from Morocco to Iraq, as well as in other states, ranging from Gabon to Albania, Iran, Kazakhstan, United States, India and others. Following weeks of protests, Egyptian president Hosni Mubarak resigned on 11 February. Major protests against longtime Libyan leader Muammar Gaddafi broke out on 17 February and quickly deteriorated into civil war, ultimately resulting in the downfall of the Gaddafi regime later in the year. Syria experienced a major uprising of people calling for the removal of President Bashar al-Assad. The Syrian uprising also deteriorated into a civil war, giving rise to the militant group, ISIS, and partly causing the current refugee crisis. In addition, Yemen, Bahrain, and Algeria have seen major protests. However, a financial analyst in Dubai suggested that "the spillover effect of the political turbulence to the large countries in the Gulf Cooperation Council is non-existent as there are no similar drivers." In mid-May 2013, Tunisia banned the Salafist Ansar al-Sharia from carrying out party congresses. The day after the congress was due to be carried out, clashes between security forces and party supporters in Kairouan resulted in one death amid attempts to disperse those who wanted to carry out the events. The Tunisian president, Beji Caid Essebsi, renewed the state of emergency in October 2015 for three months due to previous terror attacks. ^ Willsher, Kim (27 February 2011). "Tunisian prime minister Mohamed Ghannouchi resigns amid unrest". The Guardian. London. Retrieved 23 November 2012. ^ "Tunisia forms national unity government amid unrest". BBC News. 17 January 2011. ^ "Tunisia dissolves Ben Ali party". Al Jazeera. 9 March 2011. Retrieved 9 March 2011. ^ Beaumont, Peter (19 January 2011). "Tunisia set to release political prisoners". The Guardian. London. ^ "Tunisia election delayed until 23 October". Reuters. 8 June 2011. Retrieved 8 June 2011. ^ "Thousands protest before Tunisia crisis talks". Reuters. 23 October 2013. ^ a b Report: 338 killed during Tunisia revolution. Associated Press via FoxNews. 5 May 2012. ^ Ryan, Yasmine (26 January 2011). "How Tunisia's revolution began – Features". Al Jazeera. Retrieved 13 February 2011. ^ "A Snapshot of Corruption in Tunisia". Business Anti-Corruption Portal. Retrieved 7 February 2014. ^ Ryan, Yasmine. "Tunisia's bitter cyberwar". Al Jazeera. Retrieved 14 January 2011. ^ a b "Tunisia's Protest Wave: Where It Comes From and What It Means for Ben Ali | The Middle East Channel". Mideast.foreignpolicy.com. 3 January 2011. Retrieved 14 January 2011. ^ Borger, Julian (29 December 2010). "Tunisian president vows to punish rioters after worst unrest in a decade". The Guardian. UK. Retrieved 29 December 2010. ^ Tunisia suicide protester Mohammed Bouazizi dies, BBC, 5 January 2011. ^ Fahim, Kareem (21 January 2011). "Slap to a Man's Pride Set Off Tumult in Tunisia". The New York Times. p. 2. Retrieved 23 January 2011. ^ Worth, Robert F. (21 January 2011). "How a Single Match Can Ignite a Revolution". The New York Times. Retrieved 26 January 2011. ^ a b Davies, Wyre (15 December 2010). "Tunisia: President Zine al-Abidine Ben Ali forced out". BBC News. Retrieved 14 January 2011. ^ "Uprising in Tunisia: People Power topples Ben Ali regime". Indybay. 16 January 2011. Retrieved 26 January 2011. ^ "Trade unions: the revolutionary social network at play in Egypt and Tunisia". Defenddemocracy.org. Retrieved 11 February 2011. ^ "The Nobel Peace Prize 2015 - Press Release". Nobelprize.org. Nobel Media AB 2014. Retrieved 9 October 2015. ^ "The Sidi Bouzid Revolution: Ben Ali flees as protests spread in Tunisia". libcom.org. Retrieved 8 February 2011. ^ "Revolte Tunisie Sidi bouzid 3". YouTube. 4 January 2011. Retrieved 8 February 2011. ^ Carvin, Andy. "Sidi Bou Zid: A Jasmine Revolution in Tunisia". Storify. Archived from the original on 11 December 2013. Retrieved 7 December 2013. ^ Carvin, Andy (13 January 2011). "Online Reports Detail Chaos, Deaths in Tunisia". Washington DC: NPR. Retrieved 7 December 2013. ^ "Why you shouldn't call it the "Jasmine Revolution"". The Arabist. Retrieved 8 September 2017. ^ a b Ahelbarra, Hashem. "Tunisia: The end of an era | Al Jazeera Blogs". Blogs.aljazeera.net. Retrieved 15 January 2011. ^ "Deadly Riots in Tunisia Shut Down Schools". CBS News. 10 January 2011. Retrieved 15 January 2011. ^ "Protesters killed in Tunisia riots". English.aljazeera.net. 9 January 2011. Retrieved 15 January 2011. ^ Lemaire, Jean-Marie; Mathlouti, Rim (15 February 2011). "Redeyef, the precursor of the Tunisian revolution". France 24. Retrieved 15 February 2011. ^ a b "Riots reported in Tunisian city – Africa – Al Jazeera English". English.aljazeera.net. 20 December 2010. Retrieved 14 January 2011. ^ a b Sadiki, Larbi (27 December 2010). "Tunisia: The battle of Sidi Bouzid – Opinion – Al Jazeera English". English.aljazeera.net. Retrieved 14 January 2011. ^ Andoni, Lamis (31 December 2010). "The rebirth of Arab activism – Opinion". Al Jazeera. Retrieved 14 January 2011. ^ Ayeb, Habib (2011). "Social and Political Geography of the Tunisian Revolution" (PDF). =Review of African Political Economy, Routledge. 38:129: 467–479. ^ "Food Sovereignty and the Environment: an interview with Habib Ayeb". Review of African Political Economy. 2018. Retrieved 1 April 2019. ^ Totten, Michael J. (17 May 2012). "The Woman Who Blew Up the Arab World". World Affairs Journal. Retrieved 17 May 2012. Barack Obama mentioned me in a speech. He said I was a cop. He said I slapped Mohamed Bouazizi. He's a stupid fool for not checking. Americans are great people, but you need to do a better job of checking your information. ^ Abouzeid, Rania (21 January 2011). "Bouazizi: The Man Who Set Himself and Tunisia on Fire". Time. ^ "Suicide protest helped topple Tunisian regime". The Star. Toronto. 14 January 2011. ^ Bayat, Asef (2017). Revolution without Revolutionaries: Making Sense of the Arab Spring. Standford University Press. p. 125. ISBN 9781503602588. ^ a b Black, Ian; editor, Middle East (7 December 2010). "WikiLeaks cables: Tunisia blocks site reporting 'hatred' of first lady". The Guardian. ^ "Images posted on social-network sites show police intervening to halt disturbances ignored by national media". Al Jazeera. 20 December 2010. Retrieved 20 December 2010. ^ a b "Protests continue in Tunisia". Al Jazeera. 26 December 2010. Retrieved 26 December 2010. ^ a b "A protester dies after being shot by police, as activists criticise government repression of protests". Al Jazeera. 31 December 2010. Retrieved 31 December 2010. ^ "Protester dies in Tunisia clash: Several wounded in Sidi Bouzid as demonstrations against unemployment turn violent". Al Jazeera. 25 December 2010. Retrieved 25 December 2010. ^ Walt, Vivienne (15 February 2011). "El Général and the Rap Anthem of the Mideast Revolution". Time. Retrieved 1 March 2011. ^ "Tunisia jobless protests rage". Al Jazeera. 28 December 2010. Retrieved 14 January 2011. ^ "Job protests escalate in Tunisia". Al Jazeera. 28 December 2010. Retrieved 14 January 2011. ^ Randeree, Bilal (28 December 2010). "Tensions flare across Tunisia". Al Jazeera. Retrieved 14 January 2011. ^ a b "Tunisia struggles to end protests". Al Jazeera. 29 December 2010. Retrieved 29 December 2010. ^ "video: today a young unemployed man trying to commit a suicide in El Hamma #sidibouzid". Nawaat. 31 December 2010. Retrieved 31 December 2010. ^ Randeree, Bilal (4 January 2011). "Violent clashes continue in Tunisia – Africa". Al Jazeera. Retrieved 14 January 2011. ^ a b Ryan, Yasmine (6 January 2011). "Tunisia's bitter cyberwar". Al Jazeera. Retrieved 14 January 2011. ^ "Thousands of Tunisia lawyers strike". Al Jazeera. 6 January 2011. Retrieved 14 January 2011. ^ Sandels, Alexandra (8 January 2011). "Rioting spreads across Tunisia; unrest also reported in Algeria". Los Angeles Times. Retrieved 14 January 2011. ^ "Tunisia unrest spreads to capital – Africa". Al Jazeera. Retrieved 14 January 2011. ^ "Tunisi. Aggredita la troupe del Tg3" (in Italian). TG3. 12 January 2011. Retrieved 12 January 2011. ^ a b "Tunisia imposes curfew in Tunis to quell protests". BBC News. 13 January 2011. Retrieved 14 January 2011. ^ "Protests organized by Hizb ut-Tahrir calling for the re-establishment of the Islamic caliphate". YouTube. Retrieved 15 January 2011. ^ "Call for re-establishing Caliphate in streets of Tunisia and freeing political prisoners". Alokab.com. Archived from the original on 7 July 2011. Retrieved 15 January 2011. ^ Bruggmann, Matthias et al. (18 January 2011) "Lucas Mebrouk Dolega Archived 17 July 2011 at the Wayback Machine", Visa pour l'image. ^ Puech, Michel (22 January 2011) "Lucas Dolega succumbs to a hand grenade", La Lettre de la photographie. ^ "Tunisia president warns protesters". Al Jazeera. 28 December 2010. Retrieved 28 December 2010. ^ "Tunisian president removes ministers after protests". Al Arabiya. 29 December 2010. Retrieved 29 December 2010. ^ "More heads roll in Tunisian social crisis". Radio Netherlands Worldwide. 30 December 2010. Archived from the original on 10 March 2012. Retrieved 30 December 2010. ^ Randeree, Bilal (10 January 2011). "Tunisian leader promises new jobs – Africa". Al Jazeera. Retrieved 14 January 2011. ^ Ryan, Yasmine (7 January 2011) Tunisia arrests bloggers and rapper – Africa. Al Jazeera. Retrieved 9 September 2013. ^ "el général, the voice of Tunisia, english subtitles". Myvidster.com. Retrieved 26 January 2011. ^ Lewis, Aidan (14 January 2011). "Tunisia protests: Cyber war mirrors unrest on streets". BBC News. Retrieved 26 January 2011. ^ "Tunisia arrests bloggers and rapper". Al Jazeera. 7 January 2011. Retrieved 14 January 2011. ^ "Tunisian Blogger Slim Amamou Arrested". ^ "Slim Amamou (slim404) on Twitter". Twitter. Retrieved 26 January 2011. ^ "Turmoil in Tunisia: As it happened on Monday". BBC News. 17 January 2011. Retrieved 26 January 2011. ^ "Tunisia arrests Pirate Party bloggers". Christianengstrom.wordpress.com. 23 December 2010. Retrieved 14 January 2011. ^ "Pirate Party Members arrested". Torrentfreak.com. 8 January 2011. Retrieved 14 January 2011. ^ "Tunisia closes schools and universities following riots". BBC News. 10 January 2011. Retrieved 14 January 2011. ^ "Ben Ali rules out 'presidency for life' as chaos spreads". France 24. 13 January 2011. ^ Maktabi, Rima (15 January 2011). "Tunisian PM takes over as interim president as Ben Ali flees". CNN. Retrieved 14 January 2011. ^ "Tunisia President Hands Power to Prime Minister". Bloomberg BusinessWeek. 8 December 2009. Archived from the original on 17 January 2011. Retrieved 14 January 2011. ^ Walker, Peter (14 January 2011). "Tunisian president declares state of emergency and sacks government". The Guardian. London. Retrieved 28 October 2011. ^ "Prime minister takes over as Ben Ali flees Tunisian turmoil". France 24. Retrieved 15 January 2011. ^ Laghmari, Jihen (13 January 2011). "Tunisia President Hands Power to Prime Minister". Bloomberg. Retrieved 26 January 2011. ^ "Ben Ali gets refuge in Saudi Arabia". Al Jazeera. ^ Shahine, Alaa (31 January 2011). "Egypt's Military Tightens Control Over Regime". Bloomberg. Retrieved 8 February 2011. ^ Ganley, Elaine. "NewsTimes.com – The Latest". Associated Press. Archived from the original on 23 November 2018. Retrieved 14 January 2011. ^ Kirkpatrick, David D. (15 January 2011). "New Change of Power Raises Questions in Tunisia". The New York Times. ^ "Unrest engulfs Tunisia after president flees". Apnews.myway.com. Retrieved 23 November 2012. ^ "Tunisia's interim president backs a unity govt". Apnews.myway.com. Retrieved 23 November 2012. ^ "Interpol Press Release". Interpol. Archived from the original on 30 January 2011. Retrieved 8 February 2011. ^ "En Tunisie, le nouvel exécutif prépare les élections". Le Monde. Paris. 17 January 2011. Retrieved 26 January 2011. ^ "Trois chefs de l'opposition dans le gouvernement tunisien, actualité Reuters". Le Point. 17 January 2011. Archived from the original on 19 January 2011. Retrieved 26 January 2011. ^ a b "Army on streets amid Tunisia unrest". Al Jazeera. 15 January 2011. Retrieved 26 January 2011. ^ "Paris prêt à bloquer les comptes du clan Ben Ali en France". Le Monde. 15 January 2011. Retrieved 15 January 2011. L'identité de ces hommes n'a pas été établie, mais un haut responsable militaire, s'exprimant sous couvert de l'anonymat, a affirmé que des éléments loyaux au président Ben Ali se déployaient à travers la Tunisie. ^ Ganley, Elaine & Bouazza, Bouazza Ben (15 January 2011). "1,000 Inmates Freed Amid Tunisia Unrest". Time. Associated Press. Archived from the original on 16 February 2011. Retrieved 26 January 2011. ^ "Tunisia gripped by uncertainty". Al Jazeera. 16 January 2011. Retrieved 26 January 2011. ^ "Tunis gun battles erupt after Ben Ali aide arrested". BBC News. 16 January 2011. Retrieved 26 January 2011. ^ "Tunisia army tries to restore calm". Al Jazeera. 16 January 2011. Archived from the original on 19 January 2011. Retrieved 26 January 2011. ^ "Tunisia PM to unveil new government – Africa". Al Jazeera. Retrieved 23 November 2012. ^ York, Jillian C. "Tunisia's taste of internet freedom – Opinion". Al Jazeera. Retrieved 15 January 2011. ^ Luke Alnutt (2012)TANGLED WEB Tunisia: Can We Please Stop Talking About 'Twitter Revolutions'?. Retrieved 15 January 2011. ^ a b "Tunisia, Twitter, Aristotle, Social Media and Final and Efficient Causes". technosociology. 21 January 2011. Retrieved 26 January 2011. ^ "Tunisia Protests: The Facebook Revolution". The Daily Beast. 15 January 2011. Archived from the original on 19 January 2011. Retrieved 26 January 2011. ^ Madrigal, Alexis (24 January 2011). "The Inside Story of How Facebook Responded to Tunisian Hacks". The Atlantic. Retrieved 26 January 2011. ^ York, Jillian C. (14 January 2011). "Tunisia's taste of internet freedom". Al Jazeera. Retrieved 26 January 2011. ^ "Update on Tor usage in Tunisia". The Tor Blog. Retrieved 26 January 2011. ^ "Tunisian prime minister invites all political parties to form unity government". Archived from the original on 20 November 2011. ^ Sadiki, Larbi (19 January 2011). "Could Tunisian opposition groups re-ignite the revolt?". BBC News. ^ "Tunisia: Key players". BBC News. 27 February 2011. ^ "Tunisia: Violence As New Govt Announced". BSkyB. Archived from the original on 20 January 2011. Retrieved 23 November 2012. ^ a b "Tunisia announces withdrawal of 3 ministers from unity gov't: TV". People's Daily. 18 January 2011. Archived from the original on 20 January 2011. Retrieved 20 January 2011. ^ a b "Tunisia: New government leaders quit ruling party". BBC News. 18 January 2011. ^ "Tunisia leader vows break with past". Al Jazeera. 19 January 2011. Archived from the original on 19 January 2011. Retrieved 19 January 2011. ^ "Tunisia cabinet to lift party bans". Al Jazeera. 20 January 2011. Archived from the original on 20 January 2011. Retrieved 20 January 2011. ^ "Regierungsbildung in Tunesien: Ben Alis Partei ohne Politbüro". die Tageszeitung (in German). Retrieved 26 January 2011. ^ "8 Tunisian leaders quit ruling party". United Press International. 20 January 2011. Retrieved 26 January 2011. ^ "Tunisia mourns unrest victims". Al Jazeera. 21 January 2011. Retrieved 26 January 2011. ^ "Tunisian Ministry of Interior denies permit for 5 parties including Hizb ut-Tahrir". Google news. Agence France-Presse. Archived from the original on 25 May 2012. Retrieved 22 June 2011. ^ "Exiled opposition chief returns to Tunisia". The Times. Malta. 18 January 2011. Retrieved 15 March 2012. ^ "President and PM quit ruling party but hold on to posts". France 24. 18 January 2011. Retrieved 15 March 2012. ^ "Tunisian PM Pledges To Quit Politics After Elections". Radio Free Europe/Radio Liberty. 22 January 2011. Retrieved 26 January 2011. ^ "Tunisia riots: Police join protesters on the streets". Daily Mail. London. 24 January 2011. Retrieved 26 January 2011. ^ "Tunisia cabinet to be reshuffled". Al Jazeera. 24 January 2011. Retrieved 26 January 2011. ^ "Anti-govt protests intensify in Tunisia". CNN-IBN. 3 February 2010. Retrieved 26 January 2011. ^ "Tunisia issues warrant for ousted leader, family members". CNN. 26 January 2011. Retrieved 26 January 2011. ^ "Tunisia announces major cabinet reshuffle after protest". BBC News. 27 January 2011. Retrieved 8 February 2011. ^ Tunisian labor union backs reshuffle of interim government. People's Daily Online, 28 January 2011. ^ a b c Noueihed, Lin (28 January 2011). "Tunisia protesters turn government HQ into campsite". Reuters. Archived from the original on 29 January 2011. Retrieved 29 January 2011. ^ "Politics – Tunisia interior minister says predecessor arrested". The Daily Star. 2 February 2011. Archived from the original on 11 October 2017. Retrieved 8 February 2011. ^ "Tunisia replaces regional governors". Reuters. 3 February 2011. Retrieved 8 February 2011. ^ "Middle East rulers make concessions – Middle East". Al Jazeera. Retrieved 13 February 2011. ^ Bouazza Ben Bouazza (5 February 2011). "Tunisian police fire on crowd, killing 2". Fox News Channel. Associated Press. ^ "Tunisian foreign minister resigns". Al Jazeera. 13 February 2011. Retrieved 13 February 2011. ^ "Mouldi Kefi est le nouveau Ministre des Affaires Etrangères". Shemsfm.net. Retrieved 1 March 2011. ^ "Tunisia suspends activities of ex-ruling party". Reuters. 6 February 2011. Retrieved 8 February 2011. ^ "Tunisian minister suspends ex-ruling party". Fox News Channel. Associated Press. 5 February 2011. ^ "Ben Ali's RCD Party Banned By Interim Tunisian Government : NewsTime : World News". NewsTime. 7 February 2011. Archived from the original on 25 May 2011. ^ "Tunisia calls up reserve troops amid unrest". Apnews.myway.com. Retrieved 8 February 2011. ^ Bouderbala, Sofia. "Tunisian lawmakers approve emergency powers". Google. Agence France-Presse. Archived from the original on 8 February 2011. Retrieved 8 February 2011. ^ "Tunisian gov't reaches agreement with labor union on governor nomination – People's Daily Online". People's Daily. Retrieved 11 February 2011. ^ "Tunisia senate agrees to widen presidential powers". BBC News. 9 February 2011. Retrieved 11 February 2011. ^ "Tunesiens Parlament entmachtet sich". Der Standard. Retrieved 11 February 2011. ^ "France-Diplomatie". Diplomatie.gouv.fr. Archived from the original on 28 June 2011. Retrieved 11 February 2011. ^ "Tunisia protests resume for second straight day amid uncertainty of future government". Haaretz. Israel. 18 January 2011. Retrieved 1 March 2011. ^ "Thousands call for setting up parliamentary system in Tunisia – People's Daily Online". People's Daily. 21 February 2011. Retrieved 1 March 2011. ^ "PressTV – Tunisians want PM Ghannouchi gone". Press TV. 25 February 2011. Archived from the original on 4 March 2011. Retrieved 1 March 2011. ^ "Tunisian PM Mohammed Ghannouchi resigns over protests". BBC. 27 February 2011. ^ "Tunisian prime minister resigns amid renewed protests". CNN. 1 April 2011. ^ "/ Middle East & North Africa – Two more Tunisian ministers resign". Financial Times. Retrieved 1 March 2011. ^ "Zawya". Zawya. Archived from the original on 10 August 2011. Retrieved 23 November 2012. ^ "Tunisia Minister of Higher Education Ahmed Brahim Tells Reuters". Reuters. 1 March 2011. ^ "Tunisian ministers continue to quit". Al Jazeera. 1 March 2011. Retrieved 22 June 2011. ^ "Tunisia to elect constituent assembly on 24 July, says president – FOCUS Information Agency". Focus-fen.net. Retrieved 22 June 2011. ^ "Tunisia's interim president announces election of constitutional council – People's Daily Online". People's Daily. 4 March 2011. Retrieved 22 June 2011. ^ "Tunisia interim leaders dissolve secret police agency". BBC News. 7 March 2011. ^ "Tunisia's former President Ben Ali faces 18 charges". BBC News. 14 April 2011. ^ ""Post Revolution Tunisia Attempts Painful Transition to Democracy" PBS Newshour". 15 February 2012. ^ "AFP: Tunisia asks Saudi Arabia to extradite Ben Ali". Google. 20 February 2011. Archived from the original on 25 May 2012. Retrieved 1 March 2011. ^ "Tunisia's Zine al-Abidine Ben Ali 'seriously ill'". BBC News. 17 February 2011. Retrieved 20 February 2011. ^ "Tunisian PM says general amnesty to be proclaimed this week – People's Daily Online". People's Daily. 19 February 2011. Retrieved 1 March 2011. ^ "Italy declares migrant emergency – Europe". Al Jazeera. Retrieved 13 February 2011. ^ "Tunisia: Italy Asks Eu To Start Frontex Mission". Agi.it. Agenzia Giornalistica Italia. Archived from the original on 29 June 2011. Retrieved 13 February 2011. ^ "Italy 'to deploy police to Tunisia' to tackle migration". BBC News. 13 February 2011. Retrieved 13 February 2011. ^ a b "Italy struggles with Tunisia influx – Africa". Al Jazeera. 14 February 2011. Retrieved 20 February 2011. ^ "Tunisian migrants land in Italy". Al Jazeera. 2 March 2011. Retrieved 22 June 2011. ^ "Tunisia: further decline in Tunis stock market for third consecutive day". Africanmanager.com. Archived from the original on 7 July 2011. Retrieved 15 January 2011. ^ Namatalla, Ahmed (13 January 2011). "Tunisia Stocks Slump to Year-Low as Troops Deployed to Tunis Amid Curfew". Bloomberg. ^ "Tunisia c.bank CDS at 18-mth high of 154 bps-CMA". Reuters. 13 January 2011. ^ "Second Tunisian minister quits, bourse suspended". Reuters. 28 February 2011. Retrieved 1 March 2011. ^ "Tunisia's 'Jasmine Revolution' jolts Arab world". Ahram Online. Agence France-Presse. 15 January 2011. Retrieved 15 January 2011. ^ Béziat, Bruno (16 January 2011). "Tunisie : " Une prise de la Bastille "". Sud Ouest. Retrieved 17 January 2011. ^ ""Révolution du jasmin" : une expression qui ne fait pas l'unanimité". Le Monde. 17 January 2011. Retrieved 30 March 2011. ^ York, Jillian (9 January 2011). "Activist crackdown: Tunisia vs Iran – Opinion". Al Jazeera. Retrieved 14 January 2011. ^ a b Whitaker, Brian (28 December 2010). "How a man setting fire to himself sparked an uprising in Tunisia". The Guardian. UK. Retrieved 28 December 2010. ^ "The Last Days of Ben Ali?". Steven Cook's Blog. 6 January 2011. Retrieved 14 January 2011. ^ "Is Tunisia Next?". Elliott Abrams: Pressure Points. 7 January 2011. Retrieved 14 January 2011. ^ "La calamiteuse gestion de la crise tunisienne par la diplomatie française – calvero sur". Lepost.fr. Retrieved 26 January 2011. ^ Ulrich, Claire (16 January 2011). "France: Our Embarrassing Ex Friend, Monsieur Ben Ali". Global Voices. Retrieved 26 January 2011. ^ "Tunisia's Jasmine Revolution, and how mobile phones helped it happen". The Christian Science Monitor. 15 January 2011. Retrieved 26 January 2011. ^ "Today – Is this the 'Arab world's Gdansk?'". BBC News. 15 January 2011. Retrieved 26 January 2011. ^ "Khouri: Tunisia is Gdansk shipyard of '80 with Jazeera as megaphone to other Arab countries!". Mondoweiss.net. 16 January 2011. Retrieved 26 January 2011. ^ Cohen, Roger (17 January 2011). "The Arab Gdansk". The New York Times. Retrieved 28 January 2011. ^ Sadiki, Larbi. "The 'bin Laden' of marginalisation – Opinion". Al Jazeera. Retrieved 15 January 2011. ^ Andoni, Lamis (16 January 2011). "To the tyrants of the Arab world..." Al Jazeera. Retrieved 26 January 2011. ^ "Tunisia: How the US got it wrong". ^ Fisk, Robert (17 January 2011). "The brutal truth about Tunisia". The Independent. London. ^ Kravets, David. (22 August 2013) Threat Level. Wired. Retrieved 9 September 2013. ^ Anderson, Nate; Technica, Ars (14 January 2011). "Tweeting Tyrants Out of Tunisia: Global Internet at Its Best". Threat Level / Wired. ^ Westcott, Kathryn (18 January 2011). "Why do people set themselves on fire?". BBC News. Retrieved 26 January 2011. ^ Hankir, Zahra (30 January 2011). "Dubai Shares Fall Most Since May on Egypt Unrest, Pacing Mideast Decline". Bloomberg. Retrieved 1 February 2011. ^ Salafist group clashes with police in Tunisia – Africa. Al Jazeera. 20 May 2013. ^ "The real reason Tunisia renewed its state of emergency". Archived from the original on 20 December 2016. Alexander, Christopher (2010). Tunisia: Stability and Reform in the Modern Maghreb. New York: Routledge. ISBN 978-0-415-27421-0. Russo, Santi (2011). Non ho piu paura, Tunisia Diario di una rivoluzione. Rome: Gremese. ISBN 978-88-8440-690-3. Wikimedia Commons has media related to Tunisian Revolution. This page was last edited on 22 April 2019, at 10:39 (UTC).